An obsessive approach to providing a high-quality service is taking Galway-based coach hire firm, Buslink, to new heights. Buslink was established as a new corporate brand by Fergus Farrell to provide a quality service to the coach hire industry in Ireland. The objective of the company since inception has been to offer a premium coach hire service using quality coaches, exceptional personnel and an unrivalled back-up service. Every day, this quality coach hire service is provided to a full range of clients, from daily commuters and tour agencies to private hires, students and much more, with passengers ranging from toddlers to senior citizens, all of whom travel in the same luxurious comfort. Buslink can cater for groups of any size and a friendly, personal touch is provided at all times. Back in 2003, when Fergus and his father Philip started Farrell Travel, the focus was on school runs, clubs and private hire. It was work on the ‘low end’ of the coach hire business and the company used older vehicles, keeping costs down. However, Fergus saw an opportunity to expand into contract service work and in 2013 launched Buslink, with a detailed five-year business plan in place. Now, Buslink does, for example, the Limerick-Dublin Airport run for Eireagle and has focussed a lot of attention on the touring business, working with firms like Tracoin (Trafalgar-Insight) and NST. 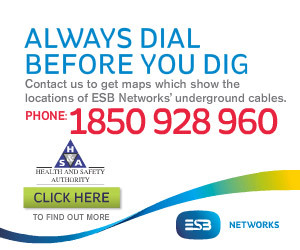 “Our game now is contract service work, our own developed service routes and tour agencies. Ultimately, we will be concentrating on the high-quality private hire,” explains Fergus. “We have strived to provide the customer with exactly what they want by standardising our vehicles right across the range – our oldest vehicle is 2011. Fergus runs an immaculate 18-vehicle fleet, from 28 / 35 seat coaches up to 49 / 53 seaters. Seven new vehicles were added in 2015 alone! As of 2016, the oldest model in the fleet will be 2012-reg and every single vehicle will boast Wi-Fi, toilets, plugs and USB ports as standard spec – for tourism, contract and service work. “I’m standardising the fleet to a very high spec so that everybody gets the same comfort,” says Fergus. “It represents a massive investment but that’s what our business plan is all about and we are following that plan precisely. We are currently one year ahead of schedule on our initial five-year business plan and every aspect of our vision so far has proven to be correct. “We have transformed Buslink into a highly-geared business that’s synonymous with quality and we have been able to secure prestigious work through various key contracts. Indeed, Buslink was selected as Best Livery & Corporate Identity award winner at the 2014 Coach & Bus Awards and was shortlisted again in ’15. “I believe our branding is very distinctive and appealing,” Fergus continues. “The success we have achieved in the past three years has been carefully planned and I’d put a lot of that down to our branding, as well as the fact that we do our job correctly, 100%, every time. Speaking of service, Buslink – which also has sub-depots in Limerick and Dublin – operates its own workshop in Athenry, where all the vehicles are subjected to regular, rigorous testing and fine-tuning at the hands of experienced, qualified technicians to ensure optimal performance. “A lot of our vehicles come with four-year, bumper-to-bumper warranties and that has obviously reduced our maintenance costs as the age profile of the fleet has improved,” the founder adds. 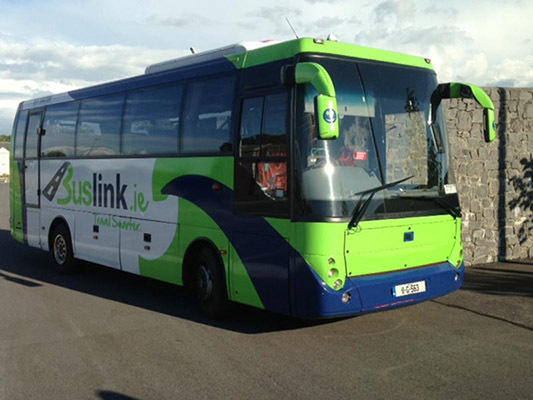 Moving forward progressively, Buslink has recently secured a new tour agency contract based in the UK, a contract which will put eight coaches to work between Ireland and the UK. Fergus notes: “The last couple of years have been fantastic on the touring side of things, with the strong sterling and US dollar. When you are touring, you can nearly always identify what the costs will be from day to day and you also know the revenue you will generate. Looking to the future, Fergus Farrell has ruled out expansion for expansion’s sake: “There has to be a saturation point,” he concludes. “Buslink wants to become a coach operator that’s looked upon in a favourable light and recognised for doing a good job. We want to be a business that people strive to replicate. “I don’t want to be the biggest operator in the country because I don’t want to sacrifice control. I will be happy to remain medium-sized but high-quality, doing quality work using quality vehicles and personnel. Rockfield Cross, Athenry, County Galway.